Welcome to the Hacking family website with Sue, Jon, Chris, Amanda, and Arthur (the sea-cat) on Ocelot, our 45-ft catamaran. As we write this (July 2004) we're currently in the Vava'u Group of islands in the northern part of the Kingdom of Tonga. After four months in the Society Islands of French Polynesia, where we had many friends come visit, we set off on our 1,400 mile passage west to Tonga at the end of the South Pacific cyclone season. Over 100 Great New Pages On The Site - Check it out! This update adds a whole new underwater section, featuring some of our scuba dives as well as lots of our underwater photography of the coral reefs now that we can take underwater digital photos. It also focuses on the Society Islands of French Polynesia. Names like Tahiti, Moorea, and Bora Bora are probably familiar to many, but we also visited the less-known islands of Huahine, Raiatea and Maupiti. Jon has added some fun stories he calls his Pre-History series - interesting tales of cruising in the 1980s, including getting pirated up the Amazon River and how we got into sailing in the first place. Chris has added a series of his thoughts on the differences between cruising and life ashore. He's also become very adept with the underwater camera, contributing much to our underwater photography. Amanda has added more schoolwork, including her carving of a Polynesian bowl. She's also responsible for all of the maps on the website. Sue has added so much to her Flora & Fauna that we moved them and gave them their own section under Landfalls. She's also updated and enhanced her Log, Cruising Cuisine and Recipes sections. 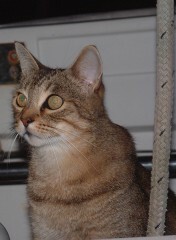 Latest News: After a lovely visit to the States to touch base with friends and family after 20 months on the boat, we returned in January, 2004 to re-join Ocelot and Arthur (who had been cared for a local teenager and family while we were gone). After two weeks of boat cleaning, sail and headstay repairs we had a fabulous 8 weeks of visitors. During that time, we traveled back and forth between Tahiti and Moorea 4 times, then sailed west to Huahine, Raiatea & Tahaa, Bora Bora and Maupiti. We did lots of scuba diving and snorkeling, hiking, bicycling, watching Tahitian dance shows, and general exploring. We had hoped to return to the Tuamotus, but the weather and the time never worked out. If you missed our last update that featured the Tuamotus and the Marquesas check them out. 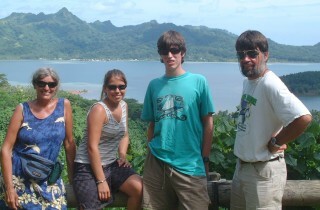 They were some of our favorite places in French Polynesia. 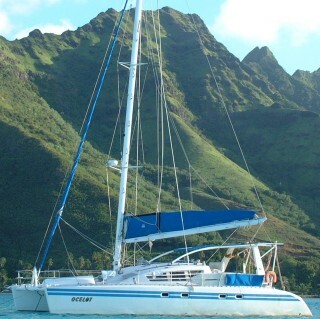 In May we jumped off for the 1,400 mile sail to the Kingdom of Tonga. Old News: If you missed earlier editions of the website, don't despair. You can see them out at our Web Archives section, including Amanda's excellent, hand-crafted & hot-spotted maps of all our previous cruising grounds. Site Stats: Having added several new sections, we now have over 375 pages on the site. (It takes us several hours to produce a fully polished page, so this site represents lots of work). We've now included over 1,100 pictures and maps, and about 8,000 hyperlinks. In all, the site fills some 80MB. Check it out! Where and when did Sue & Jon get pirated? What kind of underwater digital camera do we now use? Where did the 4 of us originally get scuba certified? How and when did Jon & Sue get attacked while underwater? Where does the word "coral" come from? Where did the name "Galapagos" Islands come from? From galapago, the Spanish word for turtle. The summit of what mountain (and in what country) is the farthest point from the center of the earth? Mt. Chimborazo, in Ecuador. The equatorial bulge places it the farthest from the core. What does Arthur (the cat) do for exercise while on passage? Not much. He walks around the deck, and jumps up and down from the helm seat. Which islands can private cruising boats visit legally in the Galapagos? San Cristobal, Santa Cruz, Floreana and Isabela. See the Galapagos Map for details. What does the word "tatu" mean, and where did the custom originate? It is the Polynesian word for "tattoo." The original Marquesan peoples tattooed their skin with hammers and sharks' teeth, hammering religious symbols into their skin for years, starting from puberty. If you're wondering where we are, or where we've been, (and what we each thought about it), and what the local Flora and Fauna looks like, check out the Landfalls pages. 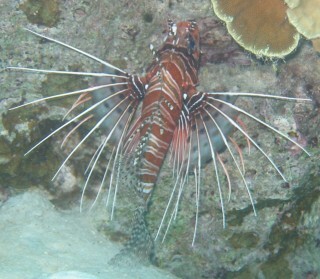 The Underwater pages showcase our underwater photography and scuba diving. On the Ocelot pages you can see pictures from all over the boat, and read its specifications and our impressions of the boat. On Jon's pages you can read his technical slant on some of the boat systems as well as some of his stories from when we cruised in the 80s. Check out Sue's pages if you want information on the culinary aspect of cruising including recipes, and insight into the cruising life. Chris writes about our inland travels, his projects and schooling. Amanda brings lots of pictures, plus school projects. The Web Archives section contains a synopsis of where we've been and what we've done, as well as previous home pages (with photos of the family and boat). The Boat Guests pages are designed to make everyone jealous of our visitors and want to come down themselves.